The cosy family-owned Shanshuiju Village Inn is housed in a cheerful yellow building in Guilin's Yangshuo Town. Located in the famous "Foreigners Village", it has free Wi-Fi and free parking. 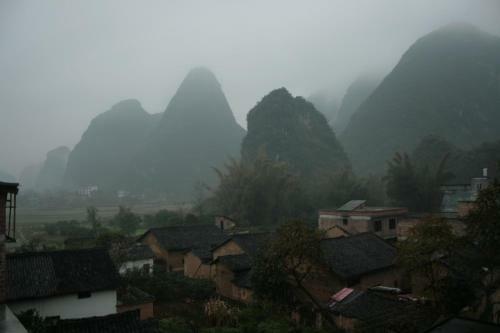 The inn is about 6 km from Shanshuiju Bus Station and central Yangshuo County. Renting a bicycle, guests may cycle about 15 minutes' to scenic attractions like Yulong River and Castle Peak. Fitted with wooden floors, the air-conditioned rooms come with a cable TV and tea/coffee making facilities. En suite bathrooms have standing showers and bath amenities. Afternoons can be spent playing a game of billiards or table tennis, or taking leisurely strolls to enjoy the fresh country air. Laundry and dry cleaning services are available for guests' convenience. Freshly brewed coffee and light snacks are served at the first-floor open-air dining area. A daily breakfast is also available there.